In a previous post I’ve explained the Schematron standard, how it works and how to use it. In the Oracle SOA Suite you can ‘Validate Semantic’ on the input (request) of a routing rule in a Mediator component by selecting a Schematron file. This is the Schemtron xml file in which you define your validation rules. The SOA Suite takes care of applying them on the request by executing the double transformation. However, to be able to get the Schematron file working you need to declare the namespaces of the input message and rewrite a report rule to an assert rule. 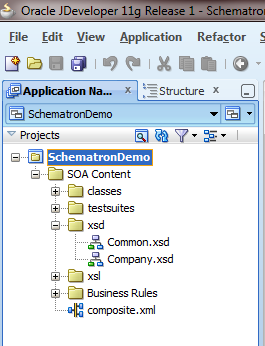 In this post I will show you how to do this with the same business rules (so the same Schematron rules and Schematron file) as the last example in a previous blog explaining Schematron. All employees should have less salary than any manager (=employee in department “Managers”). An employee may not be the manager of himself. All normal employees (so not a manager) must have a manager (I’ve added this one). There is only one manager without a manager (only one president). The relation manager and employee is a valid one, so the manager of an employee must exist. For the input xml with the employees data I’ve created two xml schema’s (xsd’s). The target namespace of the two schema’s differ on purpose, so we have to use two different namespaces for the payload in our Schematron xml rules. 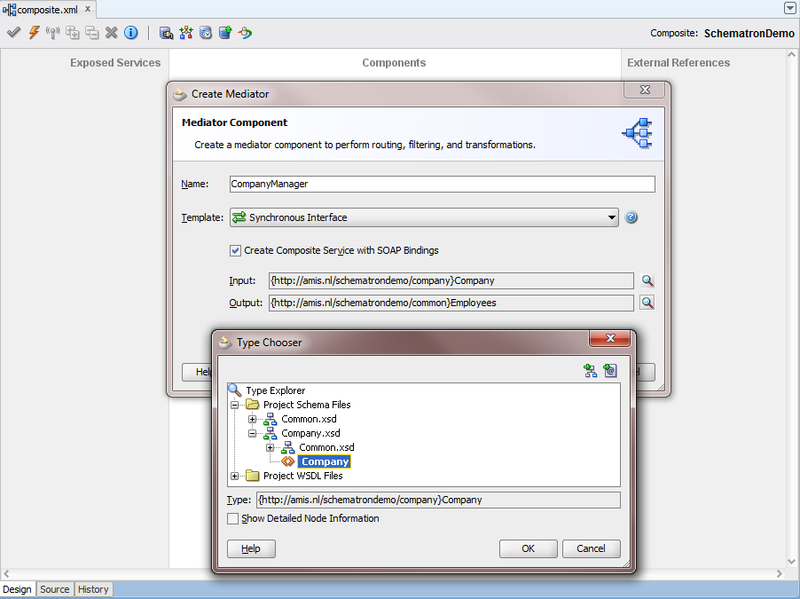 Drag a Mediator component to the empty composite and provide a decent name. 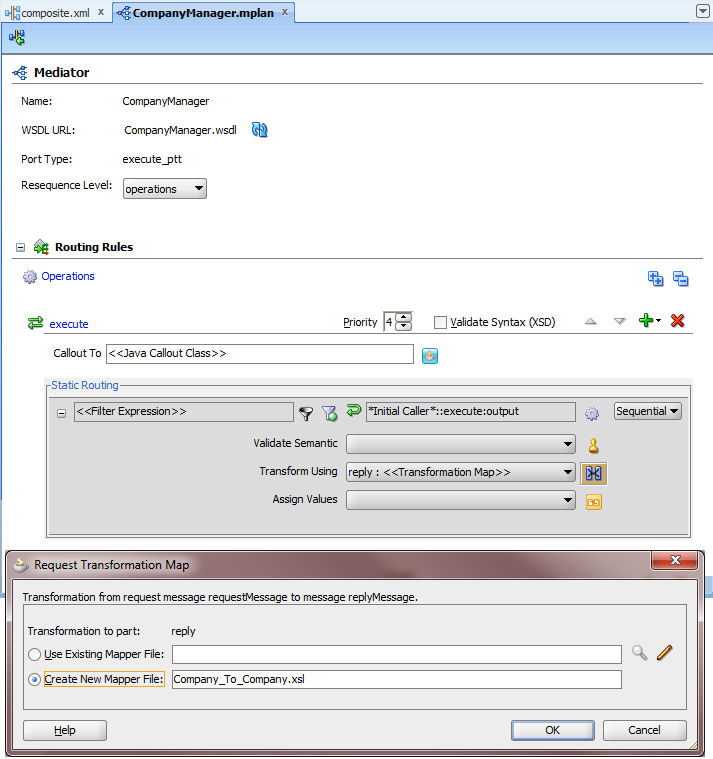 Select Synchronous Interface, enable the checkbox to expose the Mediator and define as input as well as output the Company node from the Company.xsd in our project. Deploy this demo to your SOA runtime environment and test (e.g. with soapUI) if your echo composite successfully returns your input. Be sure to use valid input data, otherwise the mapping doesn’t work. Deploy the composite again and inspect the result, the error messages, when you submit invalid xml data (e.g. 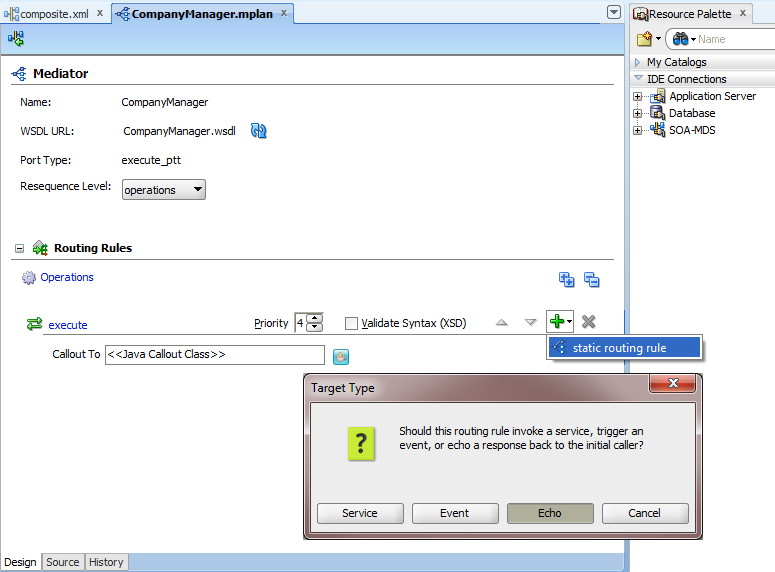 remove the obligated id attribute from the Employee node). Finally we come to the part of implementing the Schematron rules. The Schematron standard defines two types of rules: assert and report. The assert rule returns your error message when the test condition fails (returns false), whereas the report rule returns your error message when the test conditions succeeds (returns true). The Schematron implementation in the SOA Suite only supports the assert rule, so you have to rewrite your report rules. This is not much of a problem, because the assert rule is just the logical complement (inversion) of the report rule, so the logical “not” function solves this issue. In case of just a logical comparison in the test condition, you also can invert it by replacing a = operator, etc. I didn’t succeed in getting context information in my error messages, for example the id of the Employee for which an error is applicable. If somebody knows or figured out how this can be done, please let me know! I’ve zipped and uploaded this JDeveloper Schematron demo project, so you can download it. The reason why you don’t get additional context information on the error messages is because of schematron. The sch file has to be updated with elements and the xpath function that you need to return the context value. I use oXygen to develop and test my XSD’s and SCH files, which is much easier than JDeveloper. @Sabaristi See my previous blog about Schematron (http://technology.amis.nl/blog/7933/extend-xml-document-validation-with-schematron), in which I explain that the Schematron validation is in fact a double xslt transformation. The post was very useful. Thanks for this. I haveÂ doubt in this. What do u mean by ‘survive double xsl transformation’ here. ?